Those who know me have probably been baffled and confused that my blog has been so primarily focused on the world of He-Man. Indeed, even I am shocked that it has taken almost three full months for an illustration of a full-fledged Transformer to show up here (sorry Battle Beasts, being a part of the Transformers universe isn't the same as being a Transformer). Bumblebee was the fresh-faced rookie of the original Transformers cartoon--he transformed from a Volkswagen Beetle into a robot. Since then, there have been, like, a million iterations of him in the toyline, but I won't get into that. A new version of the character is also going to be one of the main characters in the upcoming Transformers live-action movie. My sketch is a pretty faithful rendition of the original cartoon version, and I was able to complete most of the drawing without needing to look at reference. Whether that's sad or awesome, I leave to you, dear reader. My pencil drawing was a little tighter, and therefore the inks were as well. The coloring on this one was fast and simple (but maybe a little bit plain and flat)--you'll note that I have left the black lines intact for the most part. The type treatment just sort of came to life on its own after the drawing was done. All in all, this was smooth-going, and I wish all my pieces came together this easily! omg... did you ACTUALLY listen to me and Jake? Excuse me for one second, I have to go pinch myself. All joking aside this is an awesome design. The lettering helps to make the whole thing very dynamic, while his pose denotes a good deal of personality. I appreciate the reworking of the text. 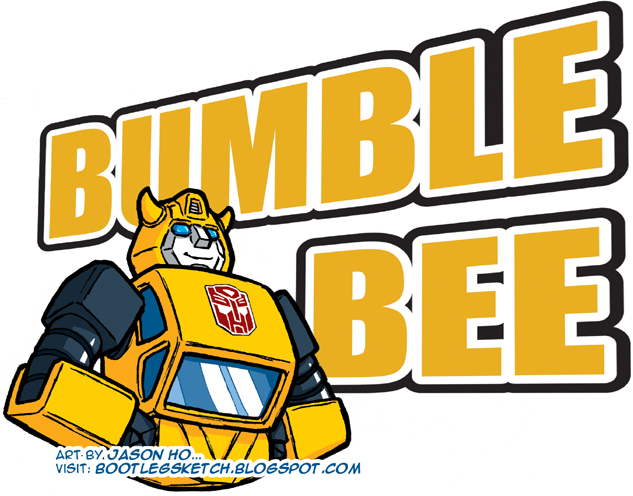 I don't mind so much the smaller text over Bumblebee as I did the larger text over 1/3rd of previous characters. It's still noticed here but isn't as distracting from the main subject of the character itself while still getting the job done. The BG text, however, is very bold and dominates over the character. That's not necessarily a bad thing. Were this an advertisement, say a billboard along a freeway, this would be 100% spot-on with getting the job done. But as a character design the BG text takes away from the character itself because it's SOOO large and such a big part of the overall composition. While the BG text moves forward in a foreshortened manner and pushes the character forward from behind, it's just SOOO big. Too beaucoup! Haha. I also get the opportunity to speak of something here you've not given me the chance to speak of to date: Composition. Now that there is an actual BG (via the larger text) I can speak of composition. The overall composition is pretty good. The golden mean is here and done with some degree of skill. Not sure if that was by design or accident. If I were you and it were an accident, I'd be more inclined to publicly state it was a result of a life's education in the artistic fields impressing upon you in a subconsciously habitual manner. In other words: you've been so exposed to it that you produce it w/o thought. It's like movies... we've all seen movies enough in this day-and-age that we all know more-or-less the patterns of storytelling whether we are conscious of it or not. Same with drawing all your life. It's a valid excuse. Hope this is all clear (I just woke up and I'm dead as hell... GRAAAAHHHHHHHH *plz note zombie moan*). Very good, Jason. If we were in a classroom setting I'd say A+ for Effort, A- for composition/design, and B- for colors (the BG text does distract the tiniest bit from the actual character itself and some amping up of the colors [meaning adding a couple more shades to denote added depth] may have brought more attention back onto BB himself). Yeah, don't do Wheelie if it's gonna knock some sweet, sweet Beast Wars lovin' off the list.